Valuation of businesses intangible assets…decision makers are obliged to know what comes before and after the dollar sign! On the other hand, there may be nothing inherently or particularly valuable about…the (physical) paper or coin currency a company may have, or a bar of gold held in the Fort Knox Depository other than our collective inclination to believe (reliance, assurance) that currency and/or gold has designated value upon which citizens can use to purchase, lend, or invest. Such universally accepted beliefs, in large part, exist because…we know, believe, and/or assume that other people, institutions, and sellers of goods and/or serves also know, believe, and assume that certain denominations of currency and bars of gold have (an agreed upon) value and those in possession of either accepts it as methods of payment for the purchase of specific amounts of goods and/or services, etc. favorably affects sources of revenue, competitiveness, brand/reputation, and sustainability, etc. how, when, where, and why particular intangibles’ actually produce – generate value, i.e., revenue, competitiveness, reputation-brand, sustainability, etc. the assets stability, fragility, and vulnerability to specific risks, which should they materialize, can-may adversely affect whether the assets can sustain – enhance their respective contributory roles or whether same will fluctuate? it is an irreversible – irrevocable, and universal economic fact today that 80+% of most company’s value, sources of revenue, competitiveness, and sustainability lie in – emerge directly from intangible assets, primarily intellectual, structural, and relationship capital. not knowing precisely where and how intangibles ‘fit’ on balance sheets and financial statements. Consequently, and with varying frequency…their proprietary – competitive advantage features and values, not infrequently, are under-appreciated, unrecognized, and undervalued. In some respects, this is what behavioral economists frequently refer to as the ‘tinker bell effect’…i.e. the value of ‘x’ lies only in – emerges from a ‘community of belief and acceptance’. So, with respect to businesses intangible (non-physical) assets, their contributory role and value…are not infrequently, still perceived by many conventional professions, i.e. financial services, valuation, and accounting, etc., as being variously subjective and/or an amount subject to negotiation, sometimes in mystifying ways. Today, building – assessing value is a collective narrative about a business brand, reputation, competitiveness, and sustainability, etc., in which leadership are fiduciarily obliged to not only identify and distinguish, but articulate with clarity precisely how, why, when, where and under what circumstances key intangible assets develop to possess, produce, and deliver contributory roles to the collective value, sources of revenues, competitiveness, and sustainability of their business. Now, that’s a very valuable and powerful business concept to be leveraged at will. business leadership are obliged to collectively acknowledge (identify, distinguish, monitor, and assess) that value and those contributions. the contributory roles, value, and competitiveness a business’s key intangible assets produce – deliver to a particular-product, service, or project can, and will likely (periodically) fluctuate, those assets will warrant monitoring as other (types-categories of) intangible assets become dominant. 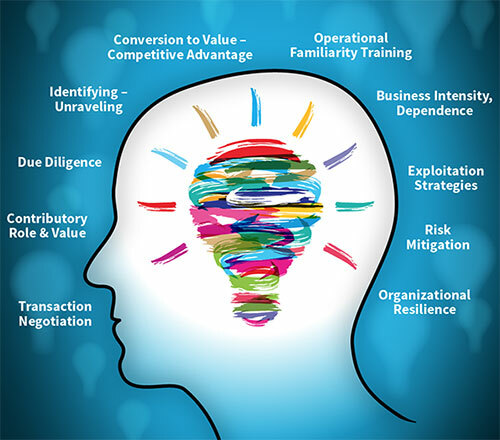 Additionally, understanding what intangible assets one’s business has…developed, acquired, matured, and have distinguishable relevance to company value, revenue generation, competitiveness, brand, and sustainability are, collectively, prudent preludes to (asset) valuation and monetization! many retain an outdated, if not obsolete, perspective about intangibles, i.e., they exist primarily, if not solely, in the context of goodwill. Respectfully, many of these professionals convey little appreciation for…the range of intangible assets that most companies, including theirs, have probably (already) developed, acquired, and are effectively exploiting, outside the buzzed arena of brand. Otherwise, their businsses intangibles, not in frequently, do not breach their conventional ‘mba radar’. first…engage management/leadership teams and boards in quick, and above all, relevant exercises designed to respectfully convey operational level familiarity with their businesses intangible assets, well beyond the narrow goodwill only context. second…describe and apply viable – relevant, and company specific strategies to value their businesses existing intangible assets their ‘contributory roles and value’ to specific aspects of a company and its mission. third…once this occurs, attention should correctly turn to exploring options and strategies to more effective leveraging, exploitation, and monetization of a company’s full array of intangible assets! Michael D. Moberly March 26, 2019 https://kpstrat.com/blog St. Louis m.moberly@kpstrat.com ‘Business Intangible Asset Blog’, since May 2006, 650+ published blog posts, read in 137+ countries, ‘where business intangible assets, attention span, and solutions converge’. Reader comments are always appreciated! Categories: Intangible asset valuation, Intangible Asset Value Tags: Knowing the value of intangible assets.